The Hamilton Aerial Group (HAG) is an aerial arts and stilt walking club making the circus arts accessible to the community. We are passionate about the arts, and even more passionate about everyone having the chance to learn and grow in a close, supportive community. HAG is a family of people from all walks of life and all sorts of artistic backgrounds with a love for aerial silks, lyra hoop, corde lisse, static trapeze and stilt walking. Lori Le Mare makes her living as a visual artist and art restorer. She became an aerialist in 1998 and later a performer in the Toronto troupe GravityWorks. After moving to Hamilton, she formed HAG (Hamilton Aerial Group) with interested people from the community. She produced 4 cabarets for the Lyric Theatre in 2012 and produced and performed in numerous events in the community as well as HAG’s first full-length play, ‘The Hangman’s Reprise’, which was performed at the 2013 Hamilton Fringe Festival and ‘Apoidea: A Bee Story’ in 2016. Lori won the 2017 Hamilton Arts Award in the dance and performing category. She continues as artistic director, aerialist performer and stilt walker for Hamilton Aerial Group. Tanis Sydney MacArthur has been a member of Hamilton Aerial Group since 2010. She is also an interpretive dance artist, stilt walker and costumier . She was co-facilitator of behind the kiln, a multi-disciplinary improvisational performance series and co-organised the Hamilton Site Specific Dance Festival in 2010. She was a founding member of d a d a d a n c e and indicaba dance theatrics. She was a cast member in Big Hill by Megan English for Dusk Dances Hamilton 2015 and Incandescent by MeredithThompson and Kate Franklin for Dusk Dances Hamilton 2016. She participated in dance outreach projects by Maxine Heppner (KRIMA!) and Peggy Baker (move). She also participated in Intersection Project by Kate Nankervis and Priscilla Guy. She performed in Once I Lived in a Box , The Crossing and Seven Duets by Learie McNicolls and Big Dance Little Stage curated by Learie McNicolls. She creates much of the costuming for HAG and has also costumed Inner City Dance Company, Defining Movement Dance, Expressions Dance Studio, Hamilton Dance Company, MacDancers, Parahumans, Momo Dance, KSWhyte-motions, the Acromaniacs, Andrea Frolic and Artword Theatre. She is a member of the Artword Theatre Ensemble and performed as an actor/dancer in You Are What You Do, Rascals and Numskulls, Langston Hughes and Tobacco Troubadour all from the 2008/09 season. 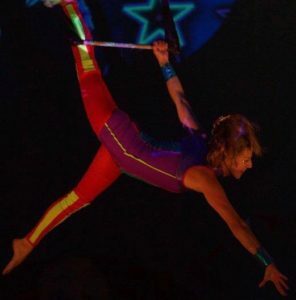 Lisa Crapsi credits her interest in fitness and all things unconventional for leading her to the Hamilton Aerial Group in 2010. Lisa began dance at a young age but did not continue to pursue it past the age of 15. Lisa believes that it was seeing Lori LeMare’s performance at Jamesville Community Centre that sparked her love for dance again. What Lisa enjoys most about this craft is the mix between strength and beauty. She continues to be a proud member of the team and is so grateful for the experiences, opportunities and friendships that have developed from being a part of the Hamilton Aerial Group. Laura Hunt is happiest when she’s upside down. She is a gymnast at heart and her love for acrobatics has taken many forms over the years. She has experience in ballet, cheerleading, acro-balance and yoga. 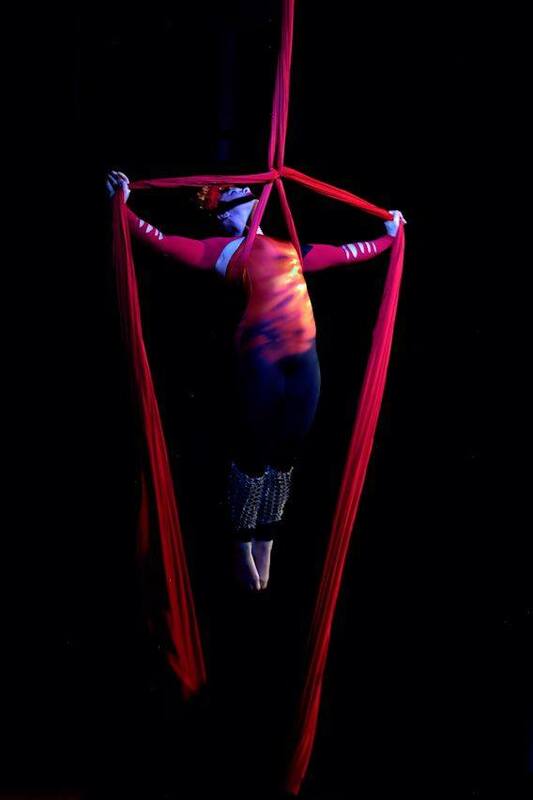 The Hamilton Aerial Group allows her to combine her interests and it is the perfect outlet for creative expression. Laura loves exploring movement and collaborating with other artists. 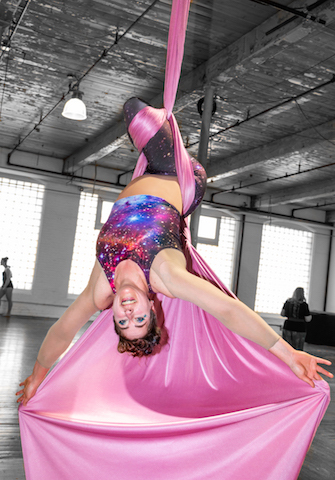 Asia Laviolette first became fascinated by aerial silks while watching a performance when she was on vacation and decided to try a class just for fun to celebrate her 25th birthday. She was immediately hooked and joined the Hamilton Aerial Group not long after. Asia has always been active and from the time she could walk, her parents signed her up for every activity possible even though she was terribly uncoordinated at conventional sports. Although her dance experience from ages 3-13 provided a foundation for her to pick up aerial arts quickly, Asia never felt passionate or that she “fit in” with these activities until she found silks. Asia is a speech language pathologist by day and enjoys spending time with her husband and their rescue puppy Jackson. Tricia Cook was introduced to the thrilling heights, physical challenge and energetic community of the early stages of HAG in November 2011. Since then she has been performing in fundraisers, festivals, corporate events, and theatre shows. When she is not getting tangled in the fabric, scaling a rope or stilt walking she is traveling, teaching, building things, growing vegetables, and studying. Molly Kubes was first introduced into HAG by a fellow gymnastics member in 2015 and instantly fell in love. She LOVES the fact that she can be creative and acrobatic in the air in a non competitive space! Molly used to be a competitive gymnast for over 9 years, and when she left she definitely missed the fun and physical challenge of the sport! Aerial silks gave her the opportunity to perform to have fun, and without the pressure of competition! Molly finds the aerial arts an opportunity to challenge herself, get creative, and go outside of her comfort zone! Molly is also a Yoga and Meditation instructor, hosting online mentorship programs on personal development through Yoga, meditation, and Reiki energy healing. In her spare time she hosts restorative aerial Yoga workshops with the crystal singing bowls, hosts Yoga retreats in Hawaii, and goes on solo adventure hikes in nature! Molly currently specializes in handbalancing, aerial hoop, and aerial silks! She also LOVES to explore doubles silks, corde de lisse, and acro yoga. 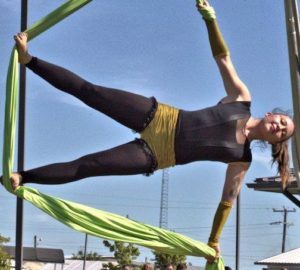 Tammy Penny became interested in aerial silks when she saw an outdoor show during one of Hamilton’s art crawls. She had been a competitive provincial trampolinist during highschool, and has missed the sport since having to stop during university. Learning aerials has been the perfect mix of art and acrobatics for Tammy, and she is thrilled to be a part of HAG. Tammy works as a registered nurse and likes to explore many hobbies on the side such as painting, running, playing music, and juggling. Michelle Prosek – All it took was a one day introductory circus class, and it was love at first inversion. Michelle has been training as an aerialist since 2011, and joined the Hamilton Aerial Group in 2015. Aerial performance is a perfect combination of focus, art, and creativity which brings together years of Michelle’s accumulated experiences ranging from glass arts, competitive swimming, performance wear design, aerial yoga, science, and holistic health practices.